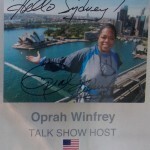 When he heard she was coming to visit us in Sydney, my mom’s boss dared her to climb the Harbour Bridge. When news of this reached Daniel and I, we immediately wanted in. 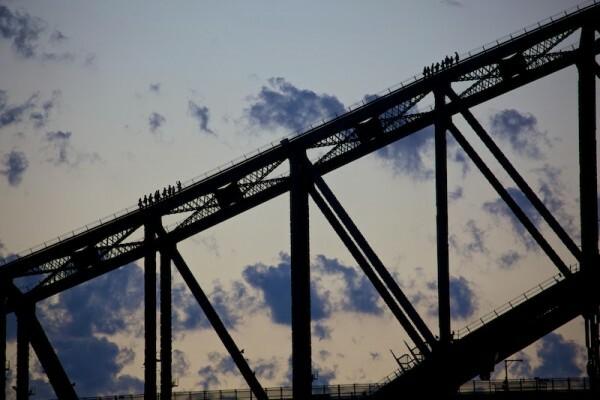 So last Wednesday, the day before we left for 6 days in the Great Barrier Reef, all 4 of us (my stepdad Sher, my mom, Daniel and me) signed up to do the Bridge Climb. We had to stagger our time slots in pairs so that someone could watch Naomi, since we believe our 1-year-old should only tag along on activities involving a harness when the potential fall is less than 440 feet. 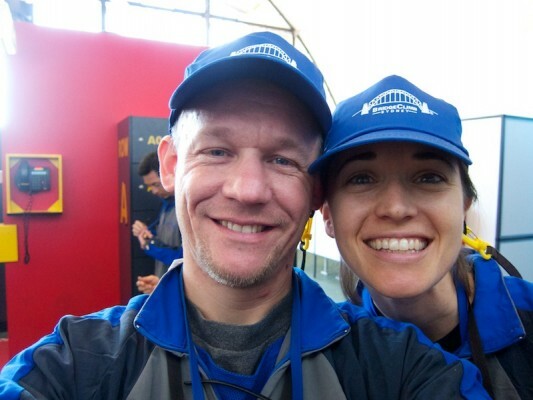 So Mom and Sher signed up for a 5 pm night climb, and Daniel and I signed up for an 11 am “Discovery Climb,” which differed from the standard climb in that it takes climbers through the inner arch of the bridge as well as the pinnacle, and explains more of the history of the bridge. 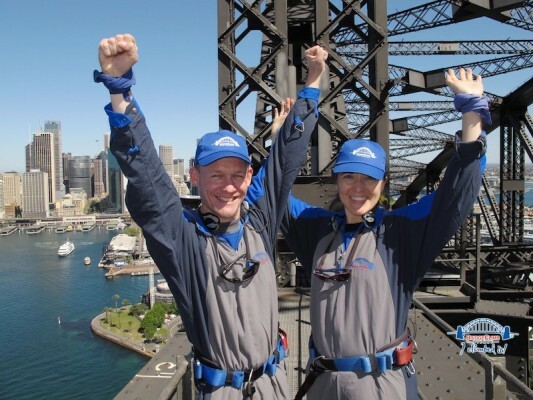 Daniel and I barely made it on time to the obscure Bridge Climb office that was lost in a tangle of side streets in The Rocks area of Sydney near the southern end of the Bridge. We showed them our printed out receipt for the ridiculously high price we’d paid online for the climb, then gulped down our sandwiches before they rushed us into a briefing room. There we were given time to fill out some forms in 60-second increments, interspersed with explanations we were supposed to be paying attention to. But with 14 foreigners (most of us not fluent in Australian), you can imagine how well that went. 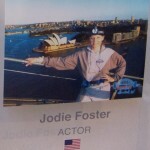 I was really glad that the girl running us through the briefing was not our guide for the climb, because in addition to the zippy schedule she was trying to keep, her personality made me feel like someone had jammed meth up my nose, and if I took 5 seconds too long in filling out my form I was going to fall off the top of the bridge. The big smile plastered on her face and the squeaks in her voice didn’t really do much to ease this sensation. She was a little stressful. One last shot in the locker room before we have to put away all our personal items for the Climb. After a “team-building” get-to-know you exercise with the other 12 people in our group, we were herded into dressing rooms with the big baggy coverall suits they gave us, along with strict instructions to remove everything from our pockets and arms. When we came out, we were all checked and finally introduced to our guide, who was much calmer and more easygoing than our previous guide (to my relief). 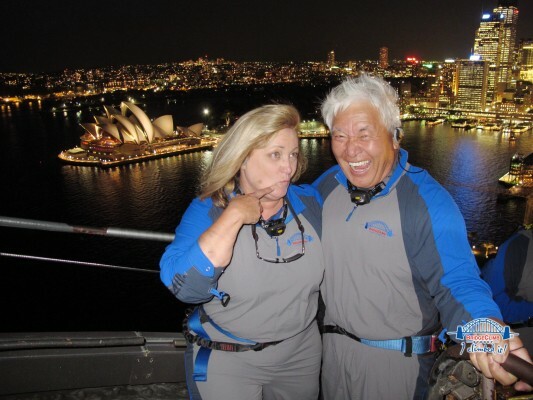 She took us into the prep room, where we all learned how to put on our harnesses and the headsets that would enable us to hear what she was saying on her mike while we were all out on the bridge. Then we were hooked into the bridge for the next 2.5 hours. Our harnesses had sliders on them that were latched onto a static line that ran the entire length of the climb. Daniel and I had both been surprised that the harnesses only went around our waists (rather than also looping around our legs), but I guess that just shows how much more dangerous we both expected the climb to be. In actuality, there were railings the entire way, and the parts of bridge that we walked along were really quite wide. I never felt like I was teetering or hanging on by a thread. I’m very glad of that too, considering how strong the wind was blowing along the way up. I felt a bit nervous starting out – especially at the beginning of the climb on the sections of catwalk that were nothing more than a see-through grate with holes so big you kind of felt like there was nothing beneath your feet between you and the water 150 feet below. Or when my safety line got stuck and tugged on me. 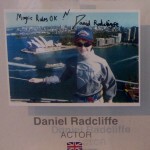 But it helped that Daniel was having a GREAT time, and after a bit I relaxed and enjoyed it more. We were both surprised to discover that there was actually a lot less wind at the highest point on the bridge, as compared to the lower and middle sections. The view from the top really was awesome. What impressed me the most was how absolutely HUGE Sydney Harbour is. It’s one thing to look at it on Google Maps – things always look different in person. But even in person, all I usually see of the Harbour is a 2-mile long section of it out my window every day. It’s another thing entirely to see almost the entire expanse of the Harbour with your own eyes, and realize how massive it is, and how twisty-turny it is, with so many nooks and crannies and all kinds of interesting bridges and buildings and parks tucked into all of them. Sydney Harbour really is a truly beautiful and interesting body of water. Overall we loved doing the climb. Since becoming parents, we haven’t gotten to do things like this much anymore, and it was a great way to see Sydney from a different perspective. 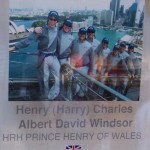 As we climbed, we learned a lot of interesting stuff about the construction of the bridge. It was built in the late 1920’s and early ’30’s. I find it frightening and a bit appalling that the men who built the arch had no harnesses, no safety lines, no railings, absolutely nothing to ensure (or even attempt to ensure) their safety. They just walked out on the steel beams and tried to keep their balance. Um…. WOW! Being up there myself, with the wind blowing firmly (and it was not a particularly windy day), I felt really nervous even though I was harnessed in! I can’t imagine doing that day after day. I have a lot of admiration for those men. Can somebody please tell me why these guys are wearing hats? My own hat (which was tied to me) was blown off my head about 4 times during the course of the climb (on our not-particularly-windy day), and each time it happened I felt like my stomach had dropped out of my body, because it felt like I was falling. I can’t imagine keeping my sanity with a non-tied-on hat on my head. Our guide told us that the 6 million rivets in the bridge are solely responsible for holding it together. The riveters worked in pairs, and each pair had a tiny oven they would bring out with them as they climbed around on the steel beams. They would heat the rivets in the oven until they were red hot, and then they would stick each rivet in its hole and pound it through. For the rivets on the more narrow beams that ran between the larger frame of the arch, one riveter would climb out onto the narrow beam while his buddy, perched on the outer frame, heated the rivet in the oven. When the rivet was hot, his buddy would throw it to him, and he would somehow manage to catch it and pound it in. All without ropes, harnesses or railings. 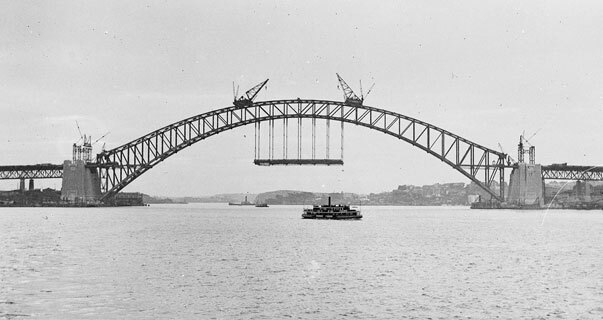 Apparently there are several hundred rivets in the bottom of Sydney Harbour as a result of this technique (and there were several injuries as well), but with 6 million rivets actually making it into the bridge, this isn’t that bad. Riggers riveting the red-hot rivets on the lower outside south chord. 1930-31. Photo by Sam Hood. Photo looking into the arch by Ted Hood. 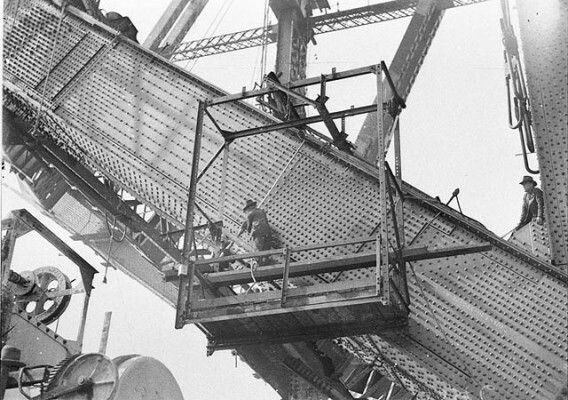 North side creeper-crane driver, 6’2″ tall “Bluey” Wilkinson, held on to my legs as I leant over the big pulley wheels at the tip of the jib, dressed in a boiler-suit. The Melbourne “Argus” [daily newspaper in Melbourne], who retained Sam Hood as their photographic representative in Sydney, used the best picture – 8″ deep x 5 columns and sent me a present of 4 guineas!” ($8.40). I’m glad Ted was excited about his 8 bucks. I personally think it’s a shame he didn’t get more than that for this amazing shot! The most interesting story to me (and my scariest moment of the climb) was hearing a story when we were nearly off the bridge. Our guide stopped the group when were about level with the platform (about 150 feet in the air) to tell us the story of the one man who survived a fall off the bridge during construction. (Apparently only 16 people total died during bridge construction, and only 2 of those deaths were due to falling from the bridge, not counting this man who survived). He fell from about the same height we were at right then (which is why it was the scariest part of the climb for me – remember what I said in a previous post about how emotionally engaged I get with stories?) He’d lost his balance while walking along a beam with a hammer in hand. Now, falling into water from that height is basically the same as falling onto concrete. But apparently he’d been an experienced diver in his school days so, in the seconds during which he was falling through the air, he somehow managed to think clearly enough to pull some of his old diving tricks out of his sleeve to soften his fall. We didn’t hear all of them, but I’m assuming one of these tricks was making his body as straight as possible, feet downward in a vertical line. (That’s the only thing I know to do, although I’m quite sure that if I actually fell from a bridge I would fail to think of this in time to actually do it.) Then, moments before he hit the water, he strategically tossed his hammer at the spot in the water where he saw he would be hitting, so that it would help break the surface and soften his landing a bit. Despite all his tricks, however, the rubber boots he’d been wearing split all the way up to his thighs, and doctors had to surgically remove the soles of the boots from the bottoms of his feet. That’s quite an impact. 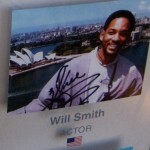 He was given 2 weeks’ paid leave from work, after which he was of course expected back on the bridge to continue working. 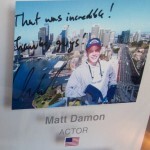 The only thing I find more astounding than that, was the fact that he actually went back to work on the bridge. I would have been terrified to get back up there. I guess he also got some kind of medal. But no workers’ comp, no litigation, nothing. This to me speaks of what difficult times the world was facing during the Great Depression – that jobs were so scarce that there was no shortage of workers for even this kind of dangerous work – and it also speaks to me of what amazing people Australians are. 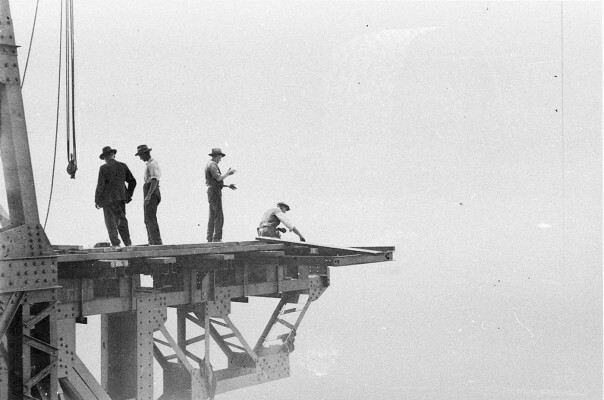 Harbour Bridge under construction on July 29, 1930. Photo credit. 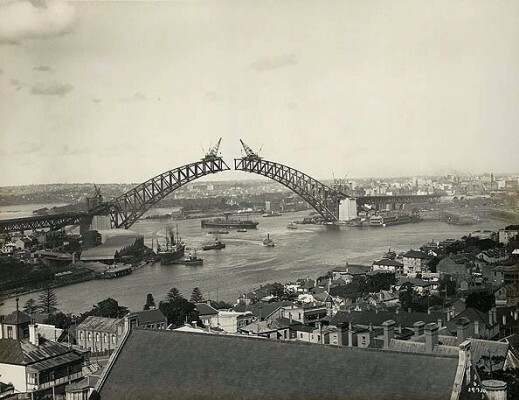 The day the Bridge opened in March 1932, Sydneysiders all over the city hung out of their windows banging pans, and marching bands and floats paraded through the streets. I thought it was cool that so many Sydney residents were so enthusiastically involved in opening day. There are actually several things that Australians have done in the name of national spirit that I think are pretty cool. An event called “Breakfast on the Bridge” was part of a city-wide food festival in October of 2009. 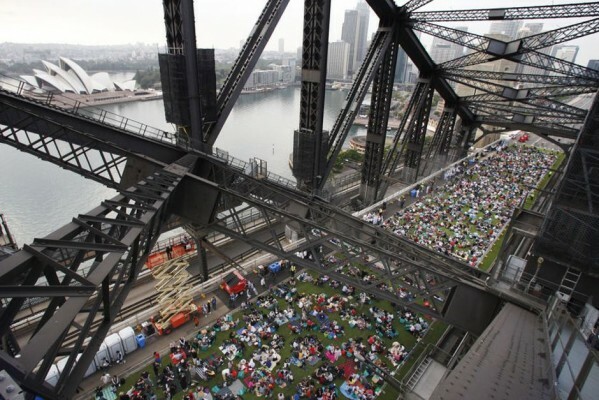 The city of Sydney chose 6,000 people from a ballot of 45,000 to win a morning picnic on the bridge. They closed all 8 lanes of traffic on the bridge, rolled out 10,000 square meters of grass, and set it up with tables and chairs and delicious food. Apparently there was live music and even a small herd of cows. Not sure if the cows would have actually added pleasure to the experience or not, but still – isn’t that creative?! I think that would be an awesome experience. Another fun thing is that every year on Australia Day (Jan. 26), all the ferries in the Harbour are festooned with streamers and decorations all day. Or how about this: on the 75th anniversary of the bridge opening in March 2007, the bridge was closed to traffic and opened to pedestrians to walk across all day long, from north to south. About a quarter of a million people participated, and they were all given commemorative hats. Loudspeakers were set up at intervals along the bridge, north to south, each set to play sounds and music from a particular era (like King Edward VIII’s abdication speech, or a famous 1975 speech by Australia’s prime minister), so that one “heard” the progression of history as they walked across the bridge. After dark, special hats replaced the earlier hats, each with an LED light inside. Such a cool and creative idea. The Guinness Book of Records lists it as the widest long span Bridge in the world (161 feet wide). Its total length is 3,770 feet long, making it the fourth longest bridge in the world. I thought it was kind of interesting and humorous that the 4 big concrete and granite pylons on the bridge (the big chunky posts sticking up vertically at either end of the bridge) are entirely unnecessary, structurally speaking. 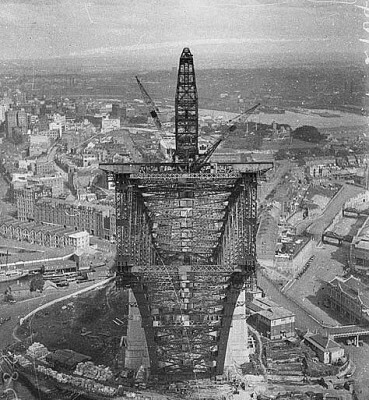 The weight of the bridge is supported by the arch and the abutment towers below the platform of the bridge – the pylons (sticking above the platform) were added later, to give the bridge aesthetic balance. I guess the locals complained that it looked unstable so the pylons were added to make them feel safer about crossing the bridge. They don’t even touch the bridge, except at street level! The bridge is repainted every 25 years, but it takes about that long to complete the job. There is a toll to cross the bridge by car, but you may walk on foot or ride on a bike for free. There is a special pedestrian walkway (part of what’s called the Cahill Walk) on the east side of the bridge, and a bike path on the west side. If pedestrians are found on this bike path by the officers who patrol it 24/7, you are fined $300. I found this out about a week after we moved here when I went for my first jog across the bridge on, you guessed it, the west side of the bridge. Thankfully the officer who pulled me aside could tell that the remorse and utter surprise on my face were genuine, and he was also compassionate, simply giving me a warning instead of charging me the $300. I was very grateful. …you can see [the Harbour Bridge] from every corner of the city, creeping into frame from the oddest angles, like an uncle who wants to get into every snapshot. From a distance it has a kind of gallant restraint, majestic but not assertive, but up close it is all might. It soars above you, so high that you could pass a ten-storey building beneath it, and looks like the heaviest thing on earth. Everything that is in it – the stone blocks in its four towers, the latticework of girders, the metal plates, the six-million rivets (with heads like halved apples) – is the biggest of its type you have ever seen… This is a great bridge. –Bill Bryson, Down Under, (2000). To get on in Australia, you must make two observations. Say, “You have the most beautiful bridge in the world” and “They tell me you trounced England again in the cricket.” The first statement will be a lie. 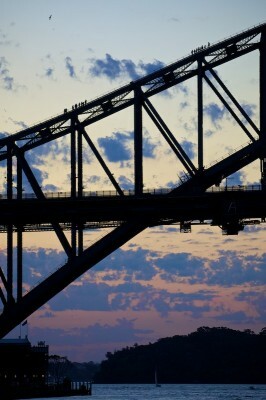 Sydney Bridge [sic] is big, utilitarian and the symbol of Australia, like the Statue of Liberty or the Eiffel Tower. But it is very ugly. No Australian will admit this. –James Michener, Return to Paradise, (1951). What a fantastic post, Katie! I loved learning all about this amazing bridge. Thank you so much for sharing with us. 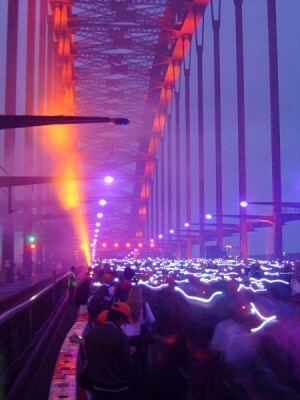 I’ve wanted to do the bridge walk ever since I heard about it several years ago. So glad you got to do this! I hope you get to do it some day Monica! Loved all the information and pictures! And I have one question…the man who fell off the bridge and survived…did he fall again and die the second time? I was kind of confused because it sounded like you were talking about the two men who died falling off the bridge, but then told a story about a man who didn’t die…can you clarify that? Thanks Emily! No, the man from this story is not one of the two who fell – those were two other men who fell and did not survive. I went back and clarified it in the post. Apparently when this guy was recuperating in the hospital, all his coworkers came to crowd around his bed to hear all the tricks he used, so that they could employ them if they too fell. I cannot imagine that being part of my daily job! It sounds incredible to do (in theory!) but I’m a big fat chicken who is terrified of heights so I am going to live vicariously through you. Just looking at the pictures gave me the heebie jeebies! 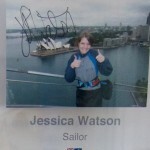 Katie..Thanks for including us in your blog. Now Barbara’s Boss will know we did it. It was incredible. I agree with you on the safety issue’s of the bridge builders. These days our labor’s can’t even get on a roof with out harness and safety gear. You do bring up a good point about the hats.